I promised you no new content for one week in yesterday’s blog post, but the problem is that I spend my life stumbling upon Starbucks content. I swear I don’t plan it, but it constantly happens. Today (3-16-2010) I had arranged to take the day off because I knew that a Starbucks partner from Wyoming (Brad Kovach) was coming into Seattle and we wanted to cup at 15th Avenue Coffee and Tea. 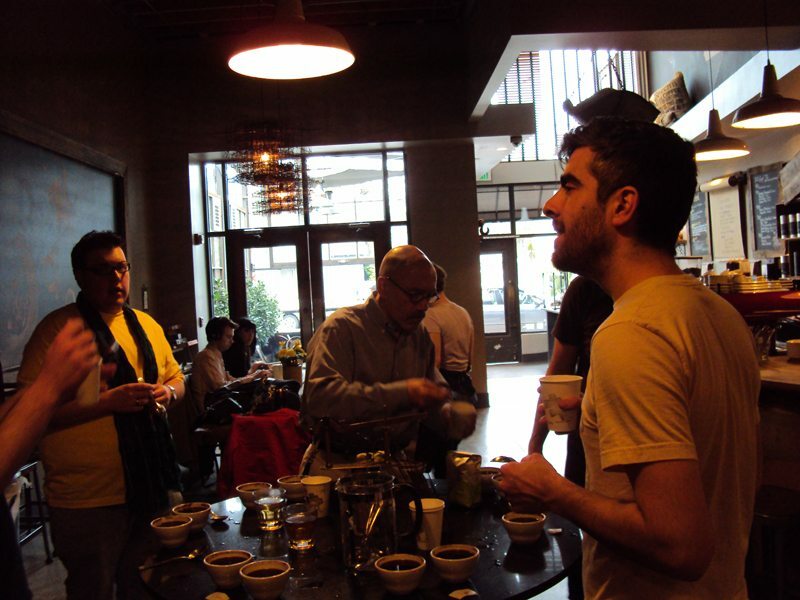 Lo and behold, included in the cupping was Starbucks Sumatra Siborong-Borong coffee. To be honest, I didn’t even know that this existed before today. The flavor notes I discovered in the Sumatra Siborong-Borong were a hint of basil, and some green fresh herbal grassy tones. It was a bit like having a non-spicy Thai dinner. It was mildly acidic. Of course, I could be completely wrong, and I think I was somewhat influenced by the packaging and a poor sense of taste due to allergies acting up. I don’t know when this coffee will be released, but I think I recall someone saying it could be a future seasonal coffee offering at Starbucks. Given the packaging of the coffee (not packaged as a Clover offering), I would guess it is a ‘coming soon’ seasonal offering. 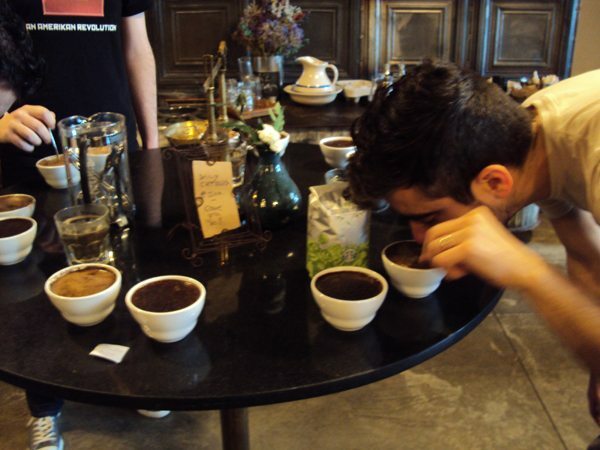 Please remember that a “cupping” and a “tasting” are two different coffee experiences. Both are important to your personal coffee education experience, but they serve slightly different purposes. The coffee “tasting” is usually two or three coffees prepared by a French press, and then actually consumed by the coffee drinker. A “tasting” may include pairing the coffee with food and then a discussion of how the food pairing alters the flavor of the coffee. 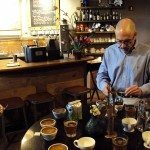 A “cupping” is often a larger number of coffees brewed side by side with a very specific brew method, and then tasted with a slurp (usually the coffee is spit out and not swallowed) working from the lightest roast coffee through to dark coffees and then finally blends. 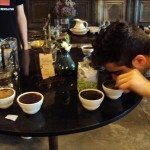 I highly recommend the “Introduction to a Cupping” blog post for more discussion of this. In many ways, a traditional “cupping” is close to what wine enthusiasts do when they’re wine tasting. 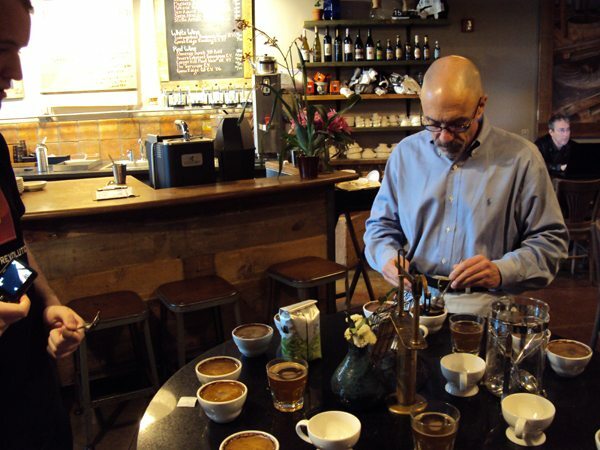 A “cupping” is the industry standard for determining the appropriate roast profile for a bean, and for creating the language found on the package which says words like “sweet” ” bold” “earthy” and “herbal”. This dang blog takes up way too much of my time, so now I am really going to take a one week break. It is an amazing amount of work to constantly come up with content, and for sure, some day I will just run out of content! Umm, I don’t see that happening any time soon! Awesome find, Melody! If it reminds you of Thai food it sounds promising to me. Maybe my memory is playing tricks on me, but I think a year or two ago we had this as one of our premium coffees that came in one of those spiffy metal boxes. I don’t think I ever got to taste it, though. I really hope to try this sometime soon! It was a Black Apron Exclusive a couple of years ago… They’ve also had it as a ground coffee in the supermarkets. (Reply to Mr. Who) – I’ve seen the ground coffee at the supermarket but I meant that I didn’t remember the whole bean version! 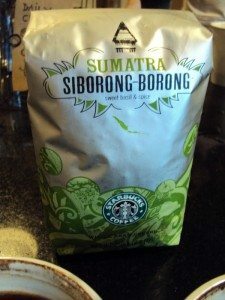 I’m excited for whole bean Sumatra Siborong-Borong coming to Starbucks!! This was such a great coffee and such a terrific chance to meet so many great people. Thank you so much for everything. I remember the Sumatra Siborong-Borong back when I worked at one of the stores near my college, back in 2006 or 2007. I remember only that is was really basil-like and herbal, not much more. Incidentally, I was just at 15th Ave. Coffee last Friday, what a great store! 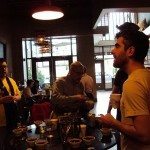 The barista in the 4th and 5th photos in this post (can’t remember his name) told me that they’re trying to convince corporate to allow on-site roasting. By the way, Melody. I will be seeing you in Seattle sometime soon, I just accepted a position in the Chemistry graduate program at UW! 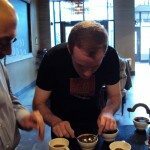 I had the pleasure of participating in my first cupping at 15th ave. last week during my vacation in Seattle…I ended up coming home with eight half lb. bags of beans that we don’t carry in TX! The barista who bagged the coffee asked me if i’d like to leave the beans in the original starbucks bags and commented “that’s the way Melody likes it”! The whole plane smelled like fresh roasted coffee on the flight back… Thanks again for a fantastic blog! Hi Johno, txmgr, and Venti_Bold – Glad you like the blog post! That’s a little bit funny story txmgr! Johno it was great meeting you in real life! 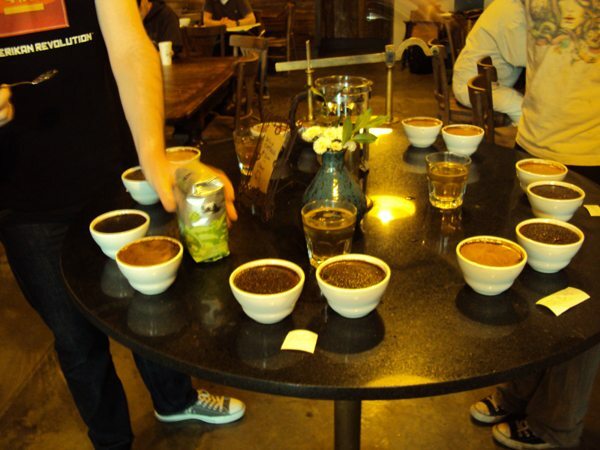 I had a blast at this cupping. It was fun because of two very special guests from Wyoming. As an aside, it must be a kick for the partners at this store to work there. They meet Starbucks partners from all over the world who come specifically to see their store. TXmgr, what part of texas are you from? Hey come back AUbarista! Now I wonder if this great Sumatra coffee is going to be distributed as an international offering only. That happens all the time! The international markets get all kinds of fun coffees. I don’t know where to put this so, here it is: this is about coffee refills now that there is the ‘pour-over’ method. I really hadn’t thought about this until I needed……or would’ve liked a refill (also a rewards benefit) of my tall coffee. Didn’t order a grande because I didn’t want it to cool…. So, the problem is, with the pour-over, I felt incredibly guilty asking for a ‘refill’, since that means making a whole ‘pour-over’ again. It’s not the same as when it’s actually brewed and they can just give you a refill. In this case, my regular store, the barista was more than willing to do this, but I just said skip it…..I really only wanted about the equal of a short. ??? anyone else have issues with this? or just me? Denise: the best thing to do is be friendly with the baristas. If you can get that good barista-customer connection, they’ll be far happier to do stuff like that, and hopefully you won’t feel as guilty, because you’ve transformed the act of getting a refill from “yet another task among the thousand we have to do” to “doing a favor for a friend.” I’m almost always happier to do stuff for the regulars I know and like than I am for Generic Customer #11,498, as are all the other baristas I know. I do agree that brewing bold all day would be the ideal solution to most of the customer issues…but, at the same time, there’s still the whole waste issue. We used to keep coffee for an hour; maybe after noon, brew up quarter-batches of bold every hour rather than half-batches every half hour? That cuts the amount we go through by 75%, and while I forget the exact math, I’m almost positive that one cup of coffee more than pays for a full urn’s worth of product. So if we sell one bold in the space of four hours, it was probably worth it; not to mention the customer loyalty it helps buy. to “Enlightened Coffee….’: believe me, I am on very friendly terms with all the baristas is my regular store…..I doubt we could be any closer in such a relationship. I wouldn’t be at this store if that weren’t the case. I did mention that the barista (actaully, the one you can see wearing the VIA earrings I made for them, in another thread) was more than glad to make another pour-over for me. I just felt it was too much to ask….. If I’d wanted it badly, I would’ve said ‘please do’. I do get what you’re saying about the relationships…… I think that’s at least half of what makes my experience at Sbux what it is. My store officially doesn’t do pourover because we have a Clover. That being said, we have the stuff, so we do it if a customer really wants it. At least I do. It’s no big deal. I see you got to cup with Major. That’s always great. As for the barista in the last picture (@Brendon), I believe that’s Matt. His hair is quite different from the last time I saw him, but I’m pretty sure it’s him. I wish I had known when I was there last week that they had this. I def would’ve gotten it. Hey Jrmy! What a disappointment that I only just realized that this Sumatra Siborong-Borong is going to international markets! Sometimes I am so jealous of customers/partners in the UK, Ireland and Europe! They get a tone of whole bean variety!!!! It’s probably not at 15th now. Well, this is a surprise for me. The bean that I had when I was a child now has coming to Starbucks. The bean that I ever planted and processed now has becoming popular. Hope this is become a great future for all farmers in my hometown. @Indra – Hi there! I have to ask this but are you from a coffee farm on Sumatra? I’ve read your post several times, not totally sure what you mean. I can easily agree with that this is a great coffee – It’s a coffee sold by Starbucks internationally, such as the UK, Ireland, and Middle East. Hi too Melody, I’m sorry if you can’t understand what I had wrote. Yes, I’m from Sumatra and Siborongborong is my hometown. Recently I’m not staying there but my parents are. I had the experience to process the coffee bean – plant, reap, and peel it until we can sell it – when I was staying there until senior high school. I was helped my parents to take care the farm, just a small farm. Actually, I ever heard about this but I thought that just a rumor. Since I found your article, I was really exciting. Now, I know that this is not just a rumor anymore. It is real. Your comment is amazing. I guess I am sometimes thrown off guard at how small the world is. I write an article about Sumatra Siborong-Borong and someone who has actually been on a farm in that town comes and comments. This is a famous growing region for coffee, from what I know. 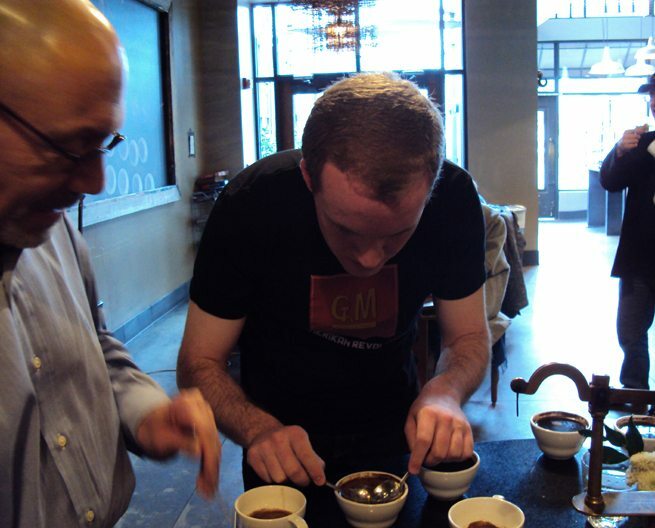 I am not a “coffee master” – That’s what Starbucks calls their coffee experts. Are you a coffee drinker? Thank you for sharing your experiences here. I feel privileged to have a coffee farmer (or former coffee farmer) right here on my blog. We may talk about connecting over the coffee, but we’d be lost without the coffee farms! I can say that I’m coffee drinker but not in the coffee cafe like Starbucks or others, since it’s too expensive I think. Maybe because I had the best taste before :D. I am wondering that if Starbucks in Korea has it or not. Wondering the taste like when it comes to Starbucks. Don’t worry about having farm or not if talking about coffee, I can share what I had experienced when I was there. And if we need more I can ask my parents about that. It’s not a big deal I think. Anyway, thank you for sharing this. I can share this story with others because of your story. I picked up some of the Siborong-borong when I was in the Brussels airport a couple of weeks ago! FABULOUS! Clearly an international only offering though as there is no mention of it whatsoever on the US SBUX website. What a shame! Hi Indra! Yes, we have this coffee (Sumatra Siborong Borong) here in S. Korea. I just bought it at our local Starbucks in Pyeongtaek (south of Osan) two days ago! 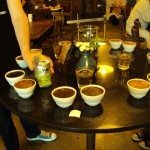 If you are here in Korea, you should pick up a bag (or a cup) – I would love to hear your take on whether it tastes the same way you remember from your youth in Sumatra.